Noise levels from the development proposed in the Development Plan will not exceed those allowed by the Town of Chapel Hill Noise Ordinance in effect at the time the Development Plan is approved. Each Site Development Plan for buildings within the approved Development Plan will conform to the attached Noise and Light Performance Standards. This document represents a common understanding of Town and University officials regarding what will be expected and accepted as fulfilling the requirements of Section 16.3.1 of the Development ordinance.for information on Noise and Light Management to he submitted as part of a Main Campus Development Plan. These standards are intended to establish maximum acceptable noise and light impacts on property* outside of the OI-4 Zoning District which result from development and redevelopment associated with an approved Development Plan. Noise levels on property* outside of the 01-4 Zoning District and resulting from development and redevelopment associated with an approved Development Plan shall not exceed noise levels allowed by the Town of Chapel Hill Noise Ordinance as established at the time the development or redevelopment receives final Town approval under Article 16 of the Development Ordinance. Each application for a Site Development Permit associated with an approved Development Plan must include a signed and sealed letter from a Professional Engineer, licensed in the State of North Carolina and with demonstrable expertise in acoustical design and attenuation practices, certifying that any increase in measurable noise above existing pre-Development Plan noise levels on property* outside of the 01-4 Zoning District will not exceed the levels allowed in the Noise Ordinance. Design Requirements: All lighting, including that used in and around buildings, recreation areas, parking areas, walkways, roadways, and signs shall be designed to minimize spillover of light onto property* outside of the 01-4 Zoning District. Lighting shall also be designed to prevent glare that could impair vision and/or otherwise deteriorate normally accepted qualities and uses of property* outside of the 01-4 Zoning District. Standards: The following standards apply to new lighting associated with an approved Development Plan. Outdoor lighting, except sports and athletic field lighting, shall be mounted at heights no greater than fifteen (15) feet for non-cutoff lights; and no greater than thirty-five (35) feet for cutoff lights. Lighting for sports and athletic fields must include glare control features and must be designed so that primary illumination is directed onto the play area and immediate surroundings, and such that offsite illumination/glare is restricted. Increases in illumination on property* outside of the OI-4 Zoning District shall not result in lighting levels in excess of 0.3 foot-candles, measured at ground level. On property* outside of the OI-4 Zoning District, where existing ambient lighting levels are in excess of 0.3 foot-candles, no increase in measurable lighting levels will be allowed as result of an approved Development Plan. Submittals: Each application for a Site Development Permit shall include a lighting plan that shows existing and proposed lighting fixture types and locations. The plan shall indicate, by isolux contour diagram and grid points, the measured and calculated pre-development and post-­development foot-candles at grade both on the development site and on property* outside of the OI-4 Zoning District where lighting impacts are expected. The lighting plan must be sealed by a Professional Engineer licensed in the State of North Carolina and with demonstrable expertise in lighting design and mitigation strategies. *These Noise and Light Standards shall not be enforced and need not be met on property outside of the OI-4 Zoning District that is in the same ownership as property within the OI-4 Zoning District. Development proposed in the Development Plan will minimize impacts on natural and man-made environmental resources. The following describes some of the measures that are in place to protect these resources as the campus proceeds to carry out the building program outlined by the Development Plan. The Environmental Master Plan developed as part of the Campus Master Plan, approved by the Board of Trustees in March 2001, identified the following principles to address issues of land and water resource management and guide the development of the land to sustain the quality of those resources. Manage total stormwater volume on-site. To the extent feasible, maximize on-site infiltration of stormwater ( existing and future) to mitigate impacts of flood and drought. Optimize open space/habitat protection and management to restore ecological functions of natural areas along streams and on steep slopes adjacent to streams. In addition to the land and buildings identified as “historic”, the University campus contains other areas of a unique and irreplaceable nature that will be protected from development under this development plan. These are: Coker Arboretum, Coker Pinetum, Polk Place, McCorkle Place, the Bell Tower plaza, the area surrounding Kenan Stadium and the top of Baity Hill. Site Development Plans for buildings in the approved Development Plan will be prepared in accordance with the UNC-Chapel Hill Construction Guidelines. All designers on campus are required to use this document in project development. The new UNC-Chapel Hill Construction Guidelines will incorporate the principles of the Environmental Master Plan and include the following language regarding site development. Design to reduce negative environmental impacts of development and to maximize opportunities to restore natural systems. Landscape should be self-sustaining and should support the conservation and restoration of biological and water resources, including species diversity and habitat protection, soil stability, fertility, and aeration. Site should support facilities for pedestrians, bicycling, carpooling, mass transit, and other less polluting means of transportation. The University campus was recently designated by the American Society of Landscape Architects as a National Landmark for Landscape Architecture. The beauty of the campus is due in large part to the park-like setting of the historical quadrangles with their large trees. Protecting trees during construction is therefore of paramount importance. A Campus Tree Inventory is currently being prepared by the Grounds Department. This inventory will provide more accurate information regarding tree locations and significance. This knowledge will guide construction and renovation project design. The University recently put in place new guidelines to protect trees from damage by construction activity. A separate tree protection plan is required for all projects. The plan identifies size, species and location of all trees affected by the construction project. It clearly indicates which trees and shrubs are to be removed from the site, which are to remain and which may require limbing to prevent damage during construction. For trees and shrubs that are to remain, protective fencing and mulch is required. When tree removal is carried out, trees and other landscape features that are to remain are protected. The tree protection plan indicates routes of all trenches necessary for installation of underground utility lines. Trenches must be designed to avoid encroachment into the drip lines of trees. In some cases tunneling may be necessary to avoid damaging tree roots. The tree protection plan also indicates the area designated for the project construction staging, parking, material storage, and waste removal. This area should be outside the drip lines of trees so as to avoid compaction of roots. If this is impossible, the plan should call for the installation of logging mats to protect tree roots within the construction staging area. Tree protection plans are developed, in consultation with the University Grounds Department and the Facilities Planning project manager, during the schematic or design development phase of the project. They are reviewed and approved by Facilities Planning, Construction Management and Grounds Departments. The plans become part of the design and construction documents for the project. The environmental master plan portion of the recently approved Campus Master Plan states: “It is important to the health of both the land and the water systems of the campus to preserve and restore open, running streams and the steep forested slopes. These two natural landscapes can also be a special asset, unique to the southern end of the campus because they are not available in the historic core. Two important stream valleys are presently preserved at the University-Battle Creek in Battle Creek Park at the northeastern end and the Meeting of the Waters Creek in the Pinetum on the western border. 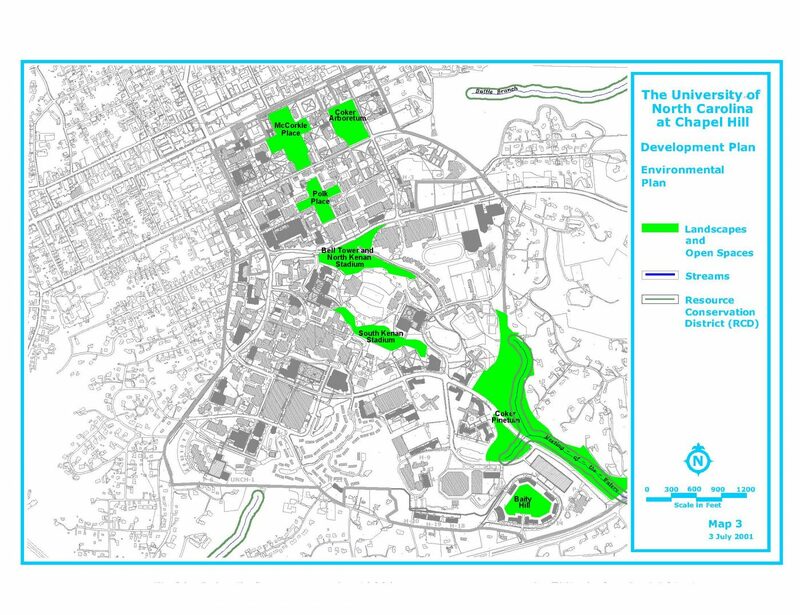 Many of the other small streams have been buried and put into pipes.” The Campus Master Plan identifies two areas on campus where stream restoration will take place: one beside Ehringhaus Field and one in the area north of the Smith Center currently occupied by surface parking. The Ehringhaus Field stream restoration is part of the 8-year Development Plan. The University campus contains several sites of archaeological significance. In particular, the historic core of the campus, shown on Map 9 “Historic Districts and Buildings Plan”, is significant because of the presence of archaeological resources associated with the development of both the University and the Town of Chapel Hill. The UNC Research Laboratories of Archaeology will be notified of proposed new construction in this area prior to project design so that documentary research, archaeological survey, and resource evaluation may be carried out. In other areas of the campus documentary research and archaeological surveys also will be undertaken prior to project design to identify and evaluate potentially significant archaeological resources. Significant resources identified in project areas may require mitigation through archaeological excavation and data recovery.